Through our national and regional media campaigns, we aim to ensure that the voice of our members is heard on important issues impacting the profession. Set up in 2017, our annual Voice of Optometry insight survey which invites members to share their experiences, has been instrumental in helping us to do this. In 2018 we launched two public awareness campaigns, on driving and vision, and children's eye health, using our Voice of Optometry findings. Our first A B See campaign, which launched on 22 August 2018, shone a spotlight on the risks of children missing out on, or delaying, sight tests. Capturing the nation’s attention were the Voice of Optometry findings. These revealed 74% of practising optometrists had seen children in the past year who had vision problems that could have been treated more successfully if they had been diagnosed at an earlier age. The campaign was featured extensively on both national and local TV and radio, including an interview on BBC Breakfast. Our message was widely covered online and in the printed press, with the importance of children’s sight tests discussed in the Huffington Post, Daily Mail and ITV News among others. Our second Don’t swerve a sight test campaign was also widely reported when it launched on 7 November. During the first week of the campaign 27 radio interviews, six articles in the printed press and 185 online articles helped to promote our message about the importance of regular sight tests for drivers, to millions of members of the public. Highlights included coverage in the Daily Mail, Metro and Telegraph and interviews on Capital FM, BBC Radio 2 and TalkSport. Our Don’t swerve a sight test message and member survey findings also gained attention in September 2018, when a police initiative saw four forces carry out roadside sight checks on all drivers stopped. In total our campaign was included in over 250 media outlets. In 2017, we increased our media coverage by 174% on 2016 using statistics from the Voice of Optometry survey. Through the thoughts, opinions and experiences of our panel members, on eye health topics, we achieved coverage across national, international, online and trade media. Our primary campaign in 2017 related to vision standards for driving. Our inaugural Don’t swerve a sight test campaign achieved 159 broadcast hits, reaching over 111 million listeners when it launched on 14 November. 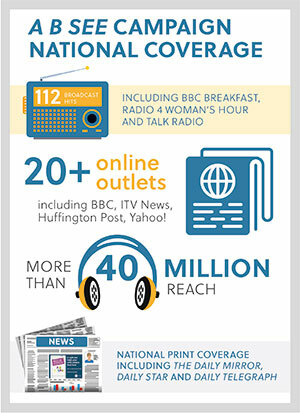 The BBC Breakfast and BBC News programmes reached a combined total of over 2.5 million. It was also covered by national newspapers, including The Telegraph and The Times, online by BBC News, Huffington Post and Yahoo!, and on the radio by Sky News and LBC.